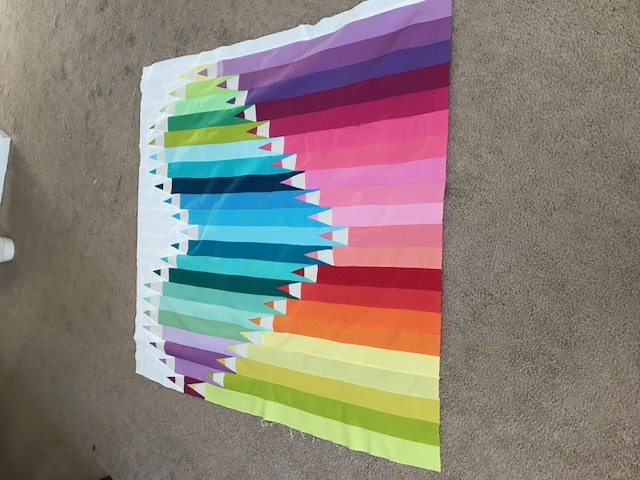 Thread: Colored Pencil Quilt quilting suggestions needed! I usually have a plan for quilting by this stage of the quilt making process. I seem to be stumped. I am adding a thin purple border and the a border of 2 inch blocks alternating white and the colors of the quilt. The pencils are what I just can't figure out how to quilt. I do fmq on my Janome 6600. Suggestions please!!! I might do straight lines down each pencil in matching coloured thread as if they are the octagon shape of HB pencils. Very cute top! i was thinking curves down the pencil but then straight lines would look good to. perhaps every other one. I was thinking about a line down the middle in gold thread - as labels are often in gold print on colored pencils. This looks like a fun quilt! It makes me think of little kids playing with color. How about a series of kittens, puppies, balloons or other things that kids would color? Very pretty, great colors. I would FMQ and call it done. Me too. wonderful work and please show a photo of it quilted. I was thinking the same thing. Easy to do with duel feed. I think an overall pattern would be best. Something geometric. I just figured out why this is driving me crazy. It would stand out by stitching in the ditch. I dislike stitch in the ditch.....I really, really don't like to do it. I really, really don't like to do it. I didn’t either until I purchased an Edge foot. It has a guide in the center of the foot making it so much easier. I just wanted to add that I think your quilt is awesome and hope you post another photo when you’ve decided how to quilt it. I'd stitch in the ditch and then reevaluate if it needs more. I'd want to highlight the piecing and make it look like pencils. 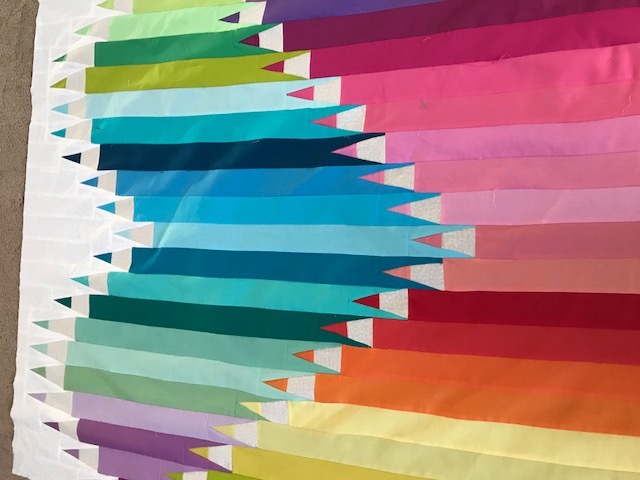 I like your idea for piecing the border with the colors of the pencils. Good color choices! I'd like to echo JMoore - the edge foot that she mentions reminds me a bit of the prow of an ice-breaker. It is almost impossible to do a bad job of stitching in the ditch with it because the prow/forward edge likes to be right on the place where the two fabrics join. I would do loops and stars. Most JoAnn's have a stencil for this...it would be cute. This quilt makes such a bold statement on it's own. I agree with jingle and ekuw, that an overall random pattern would suit it well. Especially because you are so adverse to doing SITD. I bought the ditch foot. Still not sure what I am going to do. I want the pencils to stand out. Thanks for your suggestions so far! Because it is so linear, I would definitely do something wavy thru the pencil bodies. I like the idea of echo stitching inside the pencil points to define them, perhaps all the quilting in a neutral - maybe a taupe for bottom row and a light grey for top row. I might audition a small white band at the bottom of the pencils just to stop the eye. I really like this top, so crisp and clean looking. I love your quilt-no help with the quilting as I send mine out! Straight stitch in the ditch on each pencil, then three serpentine stitch rows going down each pencil. LOVE YOUR QUILT!!! I just saw this pattern over the weekend and I love yours! As for the quilting, my first though was to mimic a #2 pencil and make a couple of straight lines to give the illusion of a hexagon, the other thought was use a wood grain design. No matter what you decide it's going to be awesome!